An ultraviolet, or UV sterilizer utilizes a germicidal fluorescent lamp to prevent the spread of microorganisms, such as bacteria and pathogens, in a fish tank. This device is also effective at killing free-floating algae. An aquarium UV sterilizer works by producing light at a wavelength that is harmful to bacteria. That wavelength is approximately 254 nanometers. As water passes over or around the UV bulb the light penetrates algae or bacteria carried by the water, and it actually mutates the generic material, or DNA, of the bacteria that prevents it from growing or multiplying. A UV sterilizer aquarium is safe for fish and live plants. The higher the wattage of the bulb the more powerful the UV radiation. Tank sterilizers feature bulbs with a low wattage that can effectively kill small microorganisms. Also, the bulb is typically contained within a housing unit, so fish will not come into contact with the light. By killing bacteria and algae, the best UV sterilizer for fish tanks can reduce time between water changes. 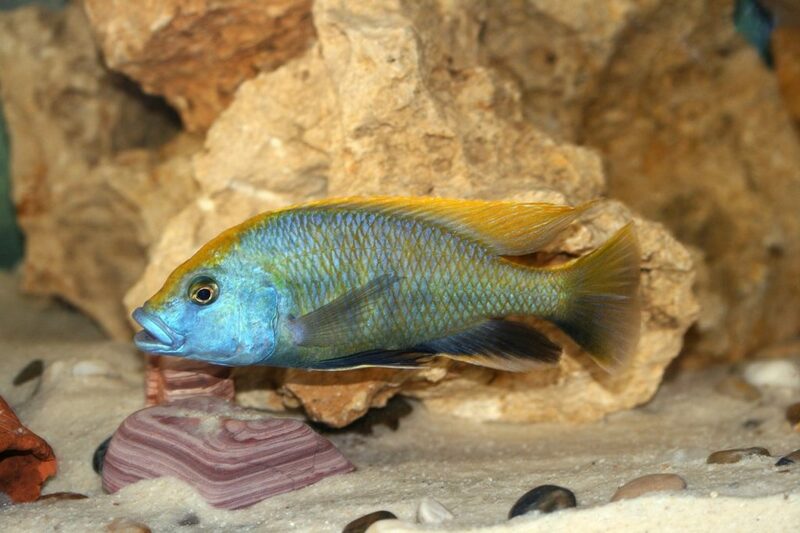 This is particularly useful for species of fish that prefer aged water, or find water changes to be disruptive. UV light is not as effective in cooler water. The ideal water temperature for UV light is between 104-degrees and 110-degrees. To allow the sterilizer to function efficiently in water temperatures beyond the ideal range a quartz sleeve is used to insulate the bulb. The quartz maintains a higher UV output while still maintaining a desirable water temperature for the aquarium inhabitants. The best UV sterilizer is effective in both fresh- and saltwater tanks. 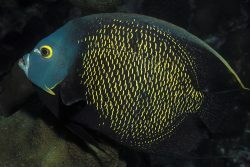 It is particularly useful in heavily stocked tanks, as well as in tanks with large amounts of corals and live rock, since catching and quarantining a diseased fish is more difficult in such setups. The purpose of a fish tank UV sterilizer is to clean water, but to maximize the effectiveness of the sterilizer the water entering the unit should be as clean as possible. 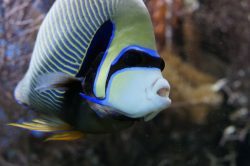 Some fish tank sterilizers feature built-in filtration for this purpose. For improved success, or if the sterilizer is not equipped with filtration, the sterilizer should be placed so that water leaving a mechanical or biological filter then enters the sterilizer. Removing solid waste allows a UV sterilizer to optimally function. It also prevents waste from building up inside of the sterilizer housing, which simplifies maintenance of the sterilizer. As with just about everything that goes into an aquarium, the size of the tank matters when selecting a fish tank sterilizer. Larger tanks require sterilizers with larger bulbs and channels that provide maximum dwell time, or contact between water and the lamp. Flow rate is significant, because the longer the water comes into contact with the bulb the more effective the sterilizer is at killing bacteria. Longer bulbs are also ideal, because that increases the contact time as water flows by. Keep your fish tank clean and clear with this Green Killing Machine Internal UV Sterilizer. This sterilizer is ideal for tropical and marine fish, and works best in tanks up to 50 gallons. A built-in powerhead pulls water through this device in a zigzag pattern to maximize contact between water and the UV lamp, also known as dwell, for improved efficiency. The UV light kills bacteria and algae that can cause cloudiness and green water. An integrated LED alerts when it is time to change the UV bulb to ensure the sterilizer is always working in top form. This fish tank UV sterilizer can be difficult to clean. Dirt and grime can accumulate inside, and it takes time and patience to fully remove this buildup since the device is enclosed. The flow rate of the powerhead is not adjustable. If this sterilizer is being used for routine maintenance this may not be a problem, but if it is being used because there is an active algae outbreak it may not be effective enough to address the problem. The Sun Microsystems In-Tank Submersible UV Sterilizer features a high frequency UV lamp to effectively kill harmful bacteria and free-floating algae in an aquarium. 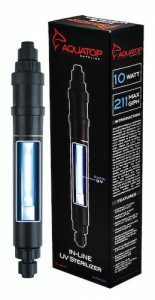 The UV lamp is also encased in a quartz sleeve compression fitting which allows for a very high light transmission rate in cold water tanks. An adjustable flow valve makes it possible to control the flow rate through the system. The ability to slow the flow increases the exposure time of waterborne algae or bacteria to the UV lamp. This can be helpful during algae outbreaks. The lamp indicator alerts when the UV bulb needs to be replaced for added convenience. Slotted sidewalls keep fish from entering the sterilizer and direct water directly into a mechanical filtration system. The filter removes solid materials, such as fish waste or uneaten food before water comes into contact with the bulb. A quick-release cap makes it simple to replace the sponge media. This sterilizer is equipped with an integrated UV lamp ballast and a single power cord for easy of setup. The built-in pump features an adjustable swivel spout for flexible placement within an aquarium. This unit is rather large, and can dominate a tank. While the quartz sleeve allows for this sterilizer to be used in a wide range of aquariums, it is easy to break, so it should be handled with care. Clean up your salt- or freshwater tank or pond with the SunSun UV Sterilizer. The built-in pump pulls water and waterborne bacteria or algae into the sterilizer. The top model in the series supports tanks up to 75 gallons and features a mechanical pre-filter sponge to remove fish waste, uneaten food, or plant detritus. Removing debris from the water improves the efficiency of the UV sterilizer. A quartz sleeve encases the UV lamp and allows the sterilizer to function in a wide range of temperatures while still eradicating harmful pathogens and algae. Choose from 5-watt, 9-watt, and 13-watt models to best fit different sized aquariums. This unit supports both vertical or horizontal installation in an aquarium or sump. Included suction cup mounting brackets make installation quick and simple. There is no flow control on this sterilizer. When water exits the return it moves fairly quickly and can generate a current. The current may be too strong for some fish species, but because it is not adjustable there is no way to address the flow. There are no instructions or manual included, which can complicate setup, but ultimately it is not too difficult to figure out how to install this unit. 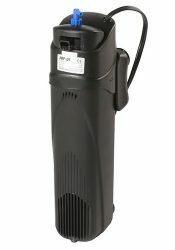 The Coralife Turbo-Twist Ultraviolet Sterilizer features a unique twist chamber that maximizes exposure between water and the UV lamp. As water winds its way through the twist chamber it experiences an increased dwell time to effectively kill any waterborne pathogens, bacteria, or free-floating algae. The double-wall light chamber adds an extra layer of protection between the UV lamp and fish and live plants outside of the sterilizer, while also extending the effectiveness of the bulb. The included Coralife bulb is made from quartz glass for maximum light emission. The mounting hardware supports both horizontal and vertical mounting for flexible placement options in an aquarium. There are several models in this series of sterilizer that range from 9-watts, 18-watts, and 36-watts. With several models to choose from that range from support to 125 gallon tanks up to 500 gallon tanks the Coralife Turbo-Twist Ultraviolet Sterilizer can be used in a variety of both salt- and freshwater aquariums. The cylindrical turbo twist chamber allows for greater exposure of water to the UV lamp. A quartz glass sleeve insulates the UV lamp, allowing for top performance in cooler water temperatures. The double wall light chamber extends the operational time of the sterilizer while also providing an extra layer of protection between the UV lamp and the tank inhabitants. 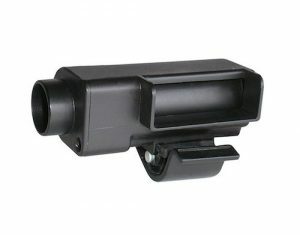 An indicator light alerts when the device is operating. This UV sterilizer does not include a water pump. In order to function optimally this unit needs to be connected to a powerhead. The size of the sterilizer determines the appropriate size of the pump. Included inserts allow for this sterilizer to be connected to different sizes pumps. Set up can still be challenging and may require sourcing additional values, tubing, or other items. The Aquatop Hang-On Filter with UV Sterilization is an all-in-one unit that will keep an aquarium clean and safe. The 5-stage filtration system utilizes mechanical, chemical and biological filtration to remove debris, odor, and ammonia. A self-adjusting surface skimmer cleans the surface of the water while also aerating the tank to remove carbon dioxide. UV sterilization utilizes a 5 to 7 watt bulb to kill dangerous pathogens, mold, bacteria, and free-floating algae. This not only eliminates disease, but it also keeps the water clear. The bulb is encased in glass to allow for improved UV performance in a range of temperatures. An adjustable water flow feature can support 64 up to 128 Gallons Per Hour (GPH) and allows this unit to be customized to best fit a variety of tanks housing different species of fish. 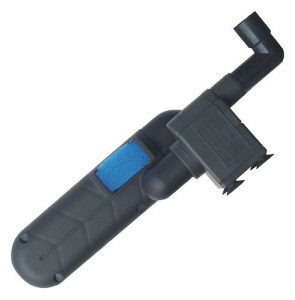 This hang-on filter has three sizes that can be used on tanks up to 15 gallons, up to 25 gallons, and up to 40 gallons. 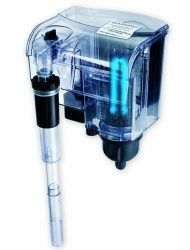 This compact device has a lot going on in a somewhat compact space, and as a result the filter media is small. This means the media needs to be replaced very frequently in order to remain effective. Changing the media often can be costly and adds to the expense of this filter. This unit is also on the loud side, and may be considered disruptive. 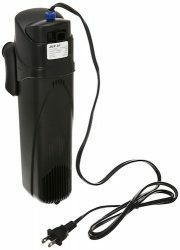 Use this UV sterilizer to get your tank under control if there is a widespread illness, or to prevent algae outbreaks. The AA Aquarium Green Killing Machine UV Filter clips onto any type of waterfall filter (not included), so water is directed straight into this device. Removing any debris from the water first prevents buildup from forming inside the sterilizer and allows the UV lamp to optimally function. Another model features suction cup installation that allows this system to quickly and easily attach to the side of a tank. The internal zigzag channel directs water back and forth to maximize contact with the UV lamp. The longer water comes into contact with UV light, or the longer the dwell, the more effective the light is at killing harmful mold, bacteria, pathogens, and free-floating algae. This fish tank UV sterilizer is ideal for tanks up to 20 gallons. The integrated LED signal alerts when the bulb needs to be replaced. The water intake is small. It is likely that not all of the water directed towards the sterilizer intake will go through the system. Some of the water will flow around the sterilizer and miss the intake. The water that flows through the device is thoroughly cleaned, but the device itself limits how much water can enter the housing, and this reduces the overall efficiency of the product. The AquaTop In-Line UV Sterilizer can be used in both fresh and saltwater aquariums. This 10-watt sterilizer features a maximum flow rate of 211 Gallons Per Hour (GPH) and takes out dangerous pathogens and floating algae, keeping the tank clean, clear, and safe. This unit can be used in-line by simply connected it to an existing water pump, or powerhead, so water is continuously fed through the system. It can also be connected to the return line of a filter. This ensures that the water that runs through the UV sterilizer is free of solid waste, and allows the sterilizer to function optimally. This sterilizer can be placed just about anyplace in a tank thanks to the long 70″ power cord. The 211 GPH flow rate is better suited for smaller tanks. This is just not powerful enough for larger tank. 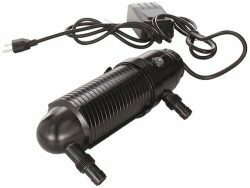 It can be difficult to achieve a watertight seal when connecting this fish tank sterilizer to a powerhead or filter. The included barbed fittings allow for a tight fit when connecting to some devices, but it may be necessary to source additional parts. An aquarium UV sterilizer does not kill algae that grows on rocks, decorations, or the tank itself. The bacteria or algae floating in the water must come into direct contact, or very near contact, with the lamp in order for the UV light to kill the microorganism. UV sterilizers are another tool to keep an aquarium clean. These devices do not replace a filter and regular maintenance, but when used in conjunction with other cleaning methods they can help reduce algae and bacteria growth. In addition to offering hassle free maintenance, a fish tank UV sterilizer operates without the use of chemicals, for peace of mind, clean water and a safe fish habitat. You can also use a UV sterilizer in reef tanks. Not all fish tank sterilizers include a water pump, or powerhead. This can be a drawback, because it requires the purchase of additional components. This can also be seen as an advantage, because it keeps components separate, so if one system fails only the failed item needs to be replaced. For instance, if an integrated pump breaks the entire sterilizer unit may need to be replaced. While if those components are separate, if a powerhead pump breaks only the powerhead pump needs to be repaired or replaced. It may cost more money upfront, but long term it may be more cost effective to have separate components. Although in small tanks it may be better to have a sterilizer with a built-in pump due to space limitations. Bulbs become less effective with age, and they typically need to be replaced every 6 months. Replacement bulbs can be expensive. It can be money well spent if the UV sterilizer helps keep a tank clean, safe, and clear, but factor in the cost of replacement bulbs when selecting a fish tank sterilizer. Let us know your thoughts or experiences in the comment section below.